Work: Sheriff of Litchfield County, ca. 1751-1775; Judge, 1750s, 60s; Militia leader, 1771-1774; Commissioner of Indian Affairs, 1775, 1784-89; Delegate to the Continental Congress, 1775-76, 1778-84; Brigadier General of the Connecticut Militia, 1776 … Lt. 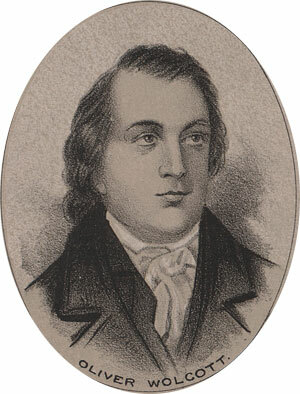 Governor of Connecticut, 1786-96; Governor, 1796-97. Oliver Wolcott was the youngest of fourteen children of then Royal Governor Roger Wolcott. Oliver attended Yale, a distiguished student, graduating in 1747. Even before graduating, he was commissioned by Governor Clinton of New York to raise a volunteer militia to assist in the French and Indian War. He did this, graduated Yale, and proceeded as Captain with his volunteer company to serve the crown on the northern frontier. At the close of the war. Wolcott studied medicine with his brother for a while. As things took their course, he was appointed sheriff of a new Litchfield County, Connecticut, around 1751. He served as sheriff for more than twenty years. In 1771 he rejoined the Militia as revolutionary tensions grew. He was made a Major, and later a Colonel in the Connecticut Militia. Before the course of the war would end, he would become Brigadier General of the entire Connecticut force, under command of the Continental Armies. In 1774 the Continental Congress appointed him a Commissioner of Indian Affairs in order to secure a treaty at the council at Albany. He was elected to the Congress in 1775. Wolcott was not very active in Congress. He was more concerned with military affairs and did suffer a bought with serious illness in 1776. He was not present for the occasion of the Declaration, but signed it some time later. He spent all of the time between 1776 and 1778 engaged in military affairs. In 1778 he was again elected to the congress, where he served until 1784. He then retired, although the congress called him twice more to serve as an Indian Commissioner. Wolcott was much revered in his native state. Yale honored him with a second degree, he was elected president of the Connecticut Society of Arts and Sciences, and in 1786 he was elected Lieutenant Governor of his state. He assumed the Governorship when Samuel Huntington died in January of 1796, and was popularly elected to the post at the following election. He died in that office in 1797 at the age of 71.